We approach sociology from a global perspective and explore real life issues that address inequality, gender, ethnicity and social change. You will be taught by leading academics with research expertise in disciplines such as migration. 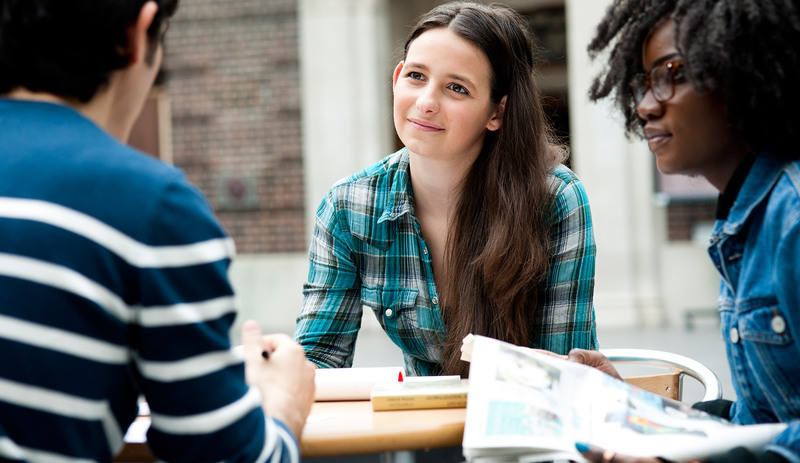 Why study BA Sociology* at Middlesex University? We offer some of the UK's most innovative sociology teaching, within a stimulating and supportive learning environment. Through studying sociology you will learn to find, extract and use both macro and micro information, from international surveys to in-depth interviews. And learn to use your findings to develop concrete, confident arguments. Alongside theoretical study, placement opportunities within a community organisation or NGO will develop your professional experience. Through learning to conduct your own research projects and by analysing the work of others, you will become a professional researcher, making you highly valued by employers across a range of sectors. One of the most enjoyable things about the course has been the variety of modules offered. They have opened my mind and allowed me to start viewing the world and society in a more analytical manner. What will you study on the BA Sociology? You will gain a thorough grounding in the major concepts and themes in contemporary fundamentals of sociology (the founding discipline of the social sciences). Focused on aspects of society through a global and historical context, you will develop your sociological knowledge and expertise. You will also choose from modules in your second and third year which focus in depth on specific areas of enquiry, such as Race, Ethnicity and Nation; and Media and Society. You will also select a research topic for your final year dissertation, based on your interests. This module provides an introduction for first year sociology and criminology students to the study of contemporary society. The module engages key issues and debates that constitute the subject matter, while introducing the themes and perspectives that inform social inquiry. You will also engage with core approaches to understanding contemporary society and the social relations that comprise it. Thinking Sociologically considers sociology as a scientific enterprise with its own distinctive ways of viewing and understanding social life, from the intimate and personal, to the more impersonal relationships between individuals, groups, and nations. Combining sociological theory and practical investigation, you will learn how living amongst others shapes our understanding of ourselves and others, as well as our everyday thoughts and actions. Thinking Sociologically also teaches us that things which appear inevitable or unalterable, can be open to change and transformation. This creates the possibility of successfully managing our personal life and the collective life we share with others. This module equips students with key sociological tools to explore social experience, or ‘doing things together’. With particular reference to the lives of young people, it explores key transformations at work in contemporary social life, including individualisation, processes of inclusion and exclusion, transformations in socialisation, changing experiences of self hood and embodiment, together with new forms of power. It does so through focusing each week on a social practice, from diet and eating together to contemporary social questions such as health and power to new forms of digital collaborations. This module develops your understanding of sociological theory by focusing on the key theories and ideas that have emerged from the late 20th to early 21st century. Specifically, it aims to develop your knowledge and understanding of the continuities and discontinuities within sociological theory during this period, and to explore the influences of classical and early modern sociological theory within contemporary sociological theory and debates. Throughout the module each of the theoretical approaches and ideas will be applied to contemporary social issues, thus underlining the relevance of the sociological imagination to an understanding of different features and social transformations which have occurred within the global world today. This module takes as its focus the transformations of institutions, relations, experiences and identities brought about by the forces of globalisation. With a particular focus on political sociology, it examines the relationship between the contemporary nation-state and the forces of change operating above, below and alongside the state. The module explores the nature, dynamics and transformations of the state, and its relationship to society, in a globalising context also associated with important social changes in the fields of mobility, culture, the media, religion and security. You will gain the theoretical, conceptual and methodological tools to evaluate the implications of globalisation for understanding the nature of, and relationship between, state and society in the contemporary era. This module explores the meanings, nature, forms and implications of popular culture. Drawing upon a range of theoretical frameworks and research methodologies, the module examines key domains of popular cultural production, with a view to understanding the ways in which these domains have been informed by the (re)production and (re)presentation of difference and identity. The module will explore popular culture both as an object of sociological enquiry and as a medium for representing and understanding social life. Specifically, the module aims to develop students’ knowledge and understanding of popular culture as a domain of social life imbued with social, cultural, economic and political meaning, and to equip students with the skills necessary to analyse such forms of cultural production. This module aims to synthesize learning from your Sociology degree providing an opportunity for you to study independently and investigate a topic in depth. It fosters academic curiosity, an inquiry based approach, the employment and application of research knowledge and skills thus facilitating the development of a higher level of theorising. You will select a topic of personal interest you wish to study in-depth and manage your own learning with the support of an allocated supervisor for this period of independent study. This module develops your critical understanding of media, communication and society. In particular, it explores different aspects of the development of media and communication within a networked global world, media institutions and the economic, political, cultural and social consequences of media concentration and convergence; media audiences and effects; media as a institution and instrument of state and state policy; and various issues and debates related to the role of the media in societies. The module also looks at the development of new media technologies as providing alternative and oppositional opportunities and perspectives; as an autonomous public sphere; as a key mobilising resource used by collective movements and protest groups to challenge dominant ideological and hegemonic representations and common sense understandings of the world. This module will be of interest to those interested in examining the role of different media and media institutions in a transnationally communicative world. This module aims to critically explore and understand violence in all its angles and meanings and from a global perspective - from personal violence, domestic violence and gender violence, to systemic violence and violence perpetrated by the state and its apparatus, from the street violence of riots and political radicalism to the inherent violence of globalisation, capitalism, fundamentalism and language. You will be offered the opportunity to develop a critical knowledge of a number of issues related to violence and to locate them both within a national and a global perspective. This module provides you with the knowledge and skills to develop an in-depth understanding of the sociology of contentious politics. The emphasis of the module is on the social context in which social movements arise to articulate and address the problems and conflicts of their time. You will be introduced to the main theoretical and conceptual approaches to the study of social conflict and social change in an historical context, as well as the epistemological and methodological issues that pertain to the study of social transformation. The module culminates in a focus on the contemporary context of the global financial crisis and the social conflicts that have arisen in its wake. This module explores gender and sexuality studies and relates theoretical debates to contemporary issues around this area. Drawing upon a range of theoretical frameworks, and the ways in which gender and sexuality have been positioned within the social sciences, this module will begin by exploring the history of feminism and its impacts on gender and sexuality studies, and continue looking at specific examples of issues related to gender and sexuality on a national and international level. Specifically, the module aims to develop your knowledge and understanding of gender and sexuality studies, recognising the important role that gender and sexuality have in regulating social life and beliefs. This module will provide a critical understanding of contemporary migratory processes, migrant communities and experiences and issues of citizenship. It will also provide an understanding of the sources and methods appropriate to the study of migration and migrant communities. This module is designed to introduce students with an insight into how demographic change (for example, population distribution, age structure, labour force participation and ethnic composition) reshapes the local as well as the global societies and their implications on economy, health, politics and overall development. The module also aims to explore current debates about ageing populations as well as to understand issues affecting individual older people. A key focus is the crucial relationship between old age and the welfare state, to a large extent concerned with the provision of support to older people. In addition, the module will assist students developing their knowledge by gathering demographics, information literacy, problem solving, ability to present explanations, written communication, critical thinking, citizenship and responsibility for the state in 21st century. This practical experience module provides the means for students to link academic work with the 'real world' situation in order to conceptualise the meaning of theory in the wider world context. This module facilitates the embedding of transferable and graduate skills necessary for future career paths and employment. It is envisaged the student will reflect upon areas of knowledge relevant to the placement learning experience and develop personal knowledge through a review of their learning. The placement learning experience provides for two types of placement; standard placements and project based placements. The placement experience provides students with the opportunity to enhance their skills of self-expression, communication, self reliance and co-operation. Students will also engage in risk assessment. How is the BA Sociology taught? You will attend lectures, seminars, workshops and one-to-one tutorials, and supplement the classes with your own independent study. You will work on weekly assignments, practical exercises and presentations as well as a dissertation. You can opt to extend the course by a year, and spend the third year doing a paid work placement, which we will help you to find. This could be with a local authority, a research institution, a voluntary organisation or even the Home Office. You will be assessed through exams and coursework – your portfolio, essays and reports as well as your dissertation. If you are unable to meet the entry requirements for this course you may still be eligible for our Foundation year course. This is an extra year of study to prepare you for the full degree. For more information see our Law and Social Sciences foundation page. Please apply via UCAS using this course’s UCAS code L300. How can the BA Sociology support your career? Sociology has a high and well established profile within higher education and offers a wider range of post-graduation employment prospects than many other academic disciplines. Career destinations include research, liaison and other positions in the public sector at local and national levels, in voluntary organisations and in the private sector. I believe that the fantastic lecturers I've had along with all the extra curricular activities I've participated in at Middlesex have helped me to educate myself and broaden my abilities. One of the most enjoyable things about the course has been the variety of modules offered. They have opened my mind and allowed me to start viewing the world and society in a more analytical manner. I've learnt many new things and have managed to do so independently whilst furthering my imagination. My dissertation project has been one of the pieces of work I'm most proud of, even if it has also been the most challenging. The sense of achievement after completing it has made it worthwhile. Once I graduate I would love to teach sociology to others and inspire them in the same way I have been.